Is PepsiCo buying Bundaberg Brewed Drinks? Simply put, No. We have entered a partnership that allows PepsiCo to distribute our local Bundaberg Brewed Drinks throughout their U.S network. Bundaberg Brewed Drinks will remain an entirely separate entity, and will continue as a family-owned company, craft brewing our drinks in Australia using time-honoured methods and the best quality ingredients, for decades to come. Will product still be brewed in Australia? Yes, Bundaberg Brewed Drinks will continue craft brewing our drinks in our home town of Bundaberg, Australia. We will continue to use time-honoured methods and the best quality ingredients, as we always have. Will product still be made in Australia? Will consumers/customers still be able to get all the flavors? Our iconic Ginger Beer, Diet Ginger Beer and Root Beer will be available nationally. On the West Coast and throughout the Mountain region, you’ll also be able to purchase our Blood Orange, Peach and Guava brewed fruit flavors. What is changing with the PepsiCo deal? You’ll now be able to buy Bundaberg Brewed Drinks in more locations throughout the U.S. No changes are being made to our beverages, the brewing process or the Australian Family Owned nature of our business. Do Bundaberg Brewed Drinks products contain gluten? Our products are gluten free and do not contain any barley, malt extract, wheat products or hops. The yeast we use in our brewing process is Saccharomyces Cerevisiae, which is suitable for Vegans, Lacto Vegetarians, Ovo-Lacto Vegetarians and Coeliacs. Do Bundaberg Brewed Drinks products contain caffeine? All the products produced by Bundaberg Brewed Drinks, with the exception of Royal Crown Draft Premium Cola, do not contain caffeine. Do Bundaberg Brewed Drinks contain Genetically Modified Organisms (GMOs)? No GMO containing ingredients or processes have been used in the manufacture of any Bundaberg Brewed Drinks products. This information is based on written assurances from our ingredient suppliers. Do Bundaberg Brewed Drinks contain allergens? Do Bundaberg Brewed Drinks Products contain alcohol? All Bundaberg Brewed Drinks naturally brewed products contain minute residual traces of alcohol. Our manufacturing process uses natural yeast which feed on sugars and ferments the ‘brew’ to be used as a base for our beverages. Alcohol is a by-product of this fermentation process. Before we fill the product into bottles we heat the brew to above 158 degrees F. to kill the yeast, halt the fermentation process, and remove the alcohol. After this heating process all of our products have a residual alcohol level of less than 0.5%. It is this manufacturing process, and the natural brew component in our beverages which adds the flavor profile unique to our products. The legal level allowable in a soft drink for it to be labelled as a non alcoholic beverage is 0.5%. We promote all of our beverages as a soft drink which is an acceptable alternative to intoxicating beverages. For further confirmation you may find information regarding Non Alcoholic Beverages in Food Standard 2.6.2 on www.foodstandards.gov.au. What sweetners are used in Bundaberg Brewed Drinks Products? Our main range uses natural cane sugar as the sweetener. Our diet products contain three sweeteners. Firstly, Acesulfame Potassium Salt (950), which is not taken up by the body. Secondly, Sucralose (955), which is made from sugar and thirdly, Aspartame (951). Aspartame is made from two amino acids – phenylalanine and aspartic acid. They are two of the basic protein building blocks that are found in milk, bread, meat, fruits and vegetables. This ingredient allows us to ensure the full bodied taste of our standard Ginger Beer, whilst keeping the sugar content to a minimum. How much sugar content is contained in the 'Diet' products? Food standards in Australia permit up to 80kJ per 100mls of sugar content. Our Diet Ginger Beer more than meet these standards with only 34kJ per 100mls or 127.5kj/12.7oz bottle – a sugar content which is residual from the natural brewing process. Diet drinks based on artificial flavors can be made with zero calorie content, but a naturally brewed product, such as ours, will contain some residual calories. The % of sugar in our 12.7oz Diet Ginger Beer, as stated on the label, is 1.2% or 0.04oz/3.4oz which equals approximately 0.16oz/12.7oz bottle. Why do Bundaberg Brewed Drinks Products contain sediment? The sediment in our products is naturally occurring as a result of the natural brewing process. The seasonal variation in our ingredients cause a differing level of sediment from batch to batch but we endeavor to blend to give our consumers as near to consistent quality as possible. How do you open the rip-cap? What does 'invert bottle before opening' mean? The advice, ‘invert before opening’ is purely a suggestion. 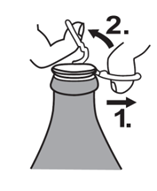 We recommend inverting – tipping upside down, all bottles before opening. This ensures that all naturally occurring sediment which can settle to the bottom of the bottle during transportation and storage is mixed throughout to deliver an optimal tasting product. We call this Rip, Flip and Sip. What is the difference between 'Best Before' and 'Use By'? Best Before’ is the recommended shelf life of the product; it indicates when the product should be consumed by to ensure it is fresh. ‘Use By’ means it must be consumed on or by that date for product safety reasons. Please visit the FSANZ (Food Standards Australia & New Zealand) website on www.foodstandards.gov.au for further information. Why aren’t the 12.7oz bottles resealable? Our 12.7oz products are a single serve product and as such the caps are not designed to be used to reseal the bottles. Our packaging is recyclable and the recycle symbol appears on our labels, wraps and cartons. Where can I buy BBD merchandise? BBD merchandise is available from our tourist centre, The Barrel, here in Bundaberg, QLD. The Barrel can be contacted on 07 4154 5480 or on The Barrel page. Are Bundaberg products Halal or Kosher certified? Our products have not been Halal or Kosher Certified due to the small number of requests we receive. Where is the ginger you use in your products grown? The ginger we use in our products is grown in Queensland, Australia. Where are Bundaberg Brewed Drinks products available? How much Ginger is in a 12.7oz bottle of Bundaberg Ginger Beer? There is approximately 0.14oz of ginger in our 12.7oz bottle of Ginger Beer. Because our products are brewed there can be slight variations from batch to batch. Are Bundaberg Brewed Drinks Products suitable for Vegans/ Vegetarians? Bundaberg Brewed Drinks products are suitable for Vegans. Lacto Vegetarians and Ovo-Lavto Vegetarians. Do the Bundaberg Brewed Drinks Diet products contain Aspartame? Why do Bundaberg Brewed Drinks brew its beverages? Why is it better? What is the difference between Root Beer and Sarsaparilla? Our Root Beer and Sarsaparilla is the same brew, just a different label depending on your location. Both are brewed over three days using real licorice root, sarsaparilla root, molasses and vanilla beans. When is Bundaberg Brewed Drinks ginger harvested? Bundaberg Brewed Drinks ginger is harvested from around 25th April until the first week in June. Are the Ginger Plants allowed to flower? Bundaberg Brewed Drinks ginger is allowed to flower. Towards the end of the growing season, around March, the ginger rhizomes will put out their flower stalks. However the flower of the eating variety of Queensland Ginger is not quite as impressive as ornamental gingers.